Finland, 1941. Three-week-old Tina loses her father in the war, leaving her mother to bring her and her siblings up alone on their farm. It is a struggle, but, thanks to her mother's courage and hard work, Tina grows into an exceptionally strong young woman with a great sense of adventure and a high moral code. As her life unfolds, she will need to resort to all these qualities on many occasions, as she is cheated out of an inheritance, becomes involved with the KGB and MI5, and struggles through a highly unsuccessful marriage, losing her son Paul to foster parents. 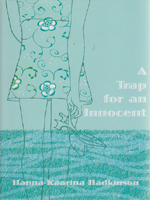 A Trap for an Innocent is a sweeping family saga covering three generations and sixty years, following young Tina in her battle to survive against all odds in a harsh and unforgiving world, and charting her progress towards maturity and independence.